Horseless Carriage Welcomed With Open Arms…NOT! Years ago, I was speaking with a nice lady who had no wild idea that the first automobiles were met with disdain rather than glad acceptance. Maybe you assume the same, since they are so indispensable to modern life in the U.S. I mean, who wouldn’t like the automobile, right? Most folks didn’t, and their responses ranged from disgust to anti-automobile legislation. Their reasons for their dislike came from a web of factors. 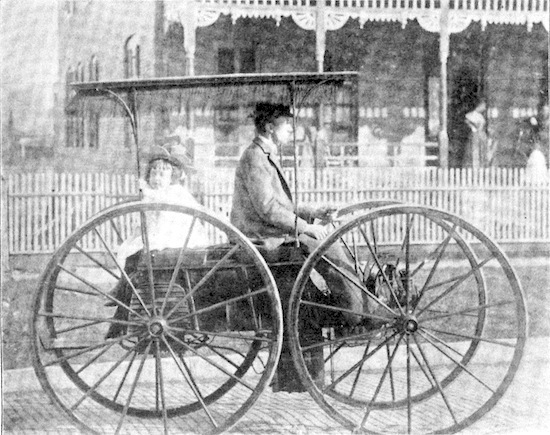 This steam-powered horseless carriage was made by John Einig of Jacksonville, Florida. To understand where people were coming from then, you need to know that gas buggies didn’t suddenly pop out of backyard sheds, shaking noisily and making horses rear up. 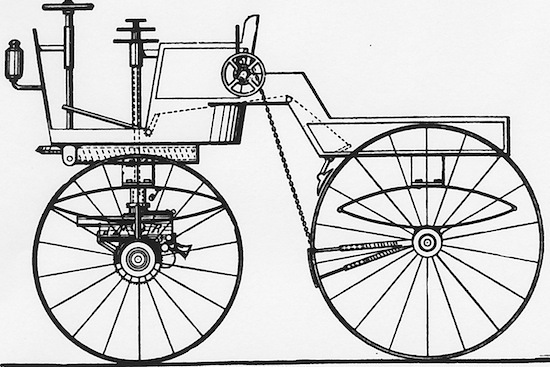 Steam-propelled roadgoing vehicles were chuffing about decades before Benz’s acclaimed Patent-Motorwagen of 1886. In reality, the entire second half of the 19th century was a seething cauldron of interweaving inventions. 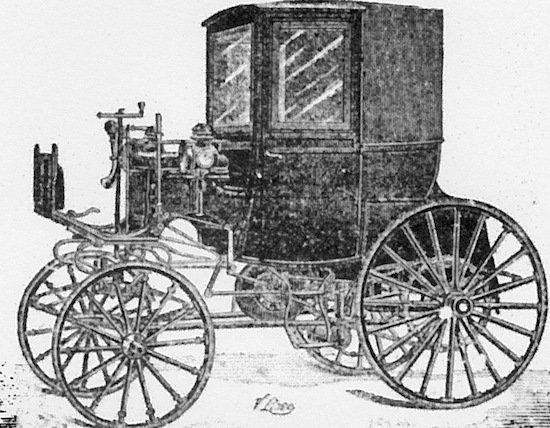 An indicator that self-propelled vehicles were already on the roads before Benz’s effort is that the first recorded automobile fatality took place in Ireland 17 years before, in 1869. The traditional steam locomotive was in production and on its rails by the early 1830s, and it wasn’t long before inventors started thinking about putting them to work hauling wagons full of people over public roadways as well. Just lose the rails and add steering. Presto, you have the first law against them by mid-century. In Merry Olde England, the first sign of alarm that these kinds of gizmos might become a problem was the passage of the Locomotive on Highways Act of 1861. A more restrictive law followed in 1865, known as the Red Flag Act. Another followed in 1878. Speed was initially restricted to 10 MPH, then later down to 4 MPH in the country and 2 MPH in town. Also required was a passenger and one more person walking 60 yards ahead and waving a red flag. Yes, this applied to what we now refer to as automobiles, too. Publicity shot from Haynes & Apperson, circa 1896. On the surface, this was a public safety issue with concerns about fatal accidents, blocked streets, panicking horses, and noise at all hours. Much like many Big Money and BigCorp-funded ads on TV today that are painted to sound like some “concerned citizen” committee, these laws were influenced by existing carriage and railway interests. Likewise, when the budding British horseless carriage interests made their own political push in 1896, it became possible to legally drive solo and hit a full 14 MPH. This was faster than some horseless carriages could go at the time, and faster than many could be driven over the more rural roads of the day. Don’t get too haughty about those restrictive European laws, my fellow Americans. Vermont had its own similar Red Flag law in 1894, and both houses of the Pennsylvania legislature passed a bill requiring all drivers of horseless carriages, “upon chance encounters with cattle or livestock to (1) immediately stop the vehicle, (2) immediately and as rapidly as possible, disassemble the automobile, and (3) conceal the various components out of sight, behind nearby bushes until equestrian or livestock is sufficiently pacified.” Boy, that law didn’t even try to sound sane. Fortunately, the governor vetoed it, but it does hint that there was an underlayment here of (A) anger, and (B) influence peddling by entrenched business interests. Some sources blame the “Quaker legislators” with a knowing wink, but who do you think might have been the “concerned citizens” goading them to effectively outlaw self-propelled carriages? A diagram from the infamous Selden Patent, where Mr. Geo. Selden initially succeeded in patenting the “hydro-carbon road engine”, the generic gas-engine automobile. The first patent troll, Selden was a patent attorney who kept amending his 1878 patent to keep up with technological developments. It was granted in 1895. He never made a working model until Henry Ford refused to pay for a license, and they fought it out from 1903-1911 in court. Ford eventually managed to win because Selden’s patent was shown to describe only the obsolete Brayton-cycle engine, while Ford and everyone else had progressed to the four-cycle still used today. Selden’s model built for the trial barely crawled along before it quickly expired. Of all the U.S. manufacturers up to that time, Ford was the only holdout that refused to sign up and pay for a license, and he only won the case on appeal. But it wasn’t just entrenched business interests that opposed automobiles. Up until about 1902 when Ransom Olds began to crank out his comparatively affordable gas buggies on an assembly line, horseless carriages were strictly a hobby device that only the very wealthy could afford. They were playthings, not serious transport. When you saw someone riding in a horseless carriage, you were looking at what resembled “the idle rich” or upper class squandering their take from their poorly paid 7-day-week workers. The middle class was minuscule – professionals like engineers, doctors and shop keepers straddling the middle ground. Minus those few, there were really only the wealthy, and some poorly paid tradesmen, farmers, and the common man living in squalor. The truly wealthy back then got that way by ruthless skullduggery against each other, and by following the traditional concept of employees as serfs or livestock. 40-hour workweeks, 10-minute breaks, minimum age and minimum wage were only distant dreams. The “merely” wealthy lived off family inheritances. To drive an automobile outside the confines of one’s city borders was often perceived as proudly flaunting the fruits of greed and oppression. None of this was universally true, but the plentiful supply of bad apples accumulating more financial clout than the federal government had its effect. Laws protecting workers against abuse and exploitation were still many years away. It figured that the early automobiles and those who drove them were held in contempt by ordinary folks struggling to get by. In rural areas, it was common to find nails thrown in the roads to cause flat tires, though pneumatic tires were so bad then that this additional measure was hardly needed. The attitudes toward automobiles in urban areas were a little more tempered and complex. 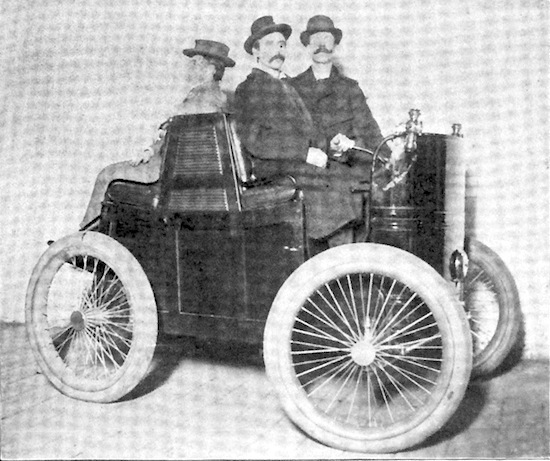 One account covered in an auto-enthusiast newsletter called The Horseless Age in 1897 noted the reaction of two first-time riders in New York City. The first was Cholly Knickerbocker, who had just purchased an electric carriage and rode along with his “motorman” at the controls. 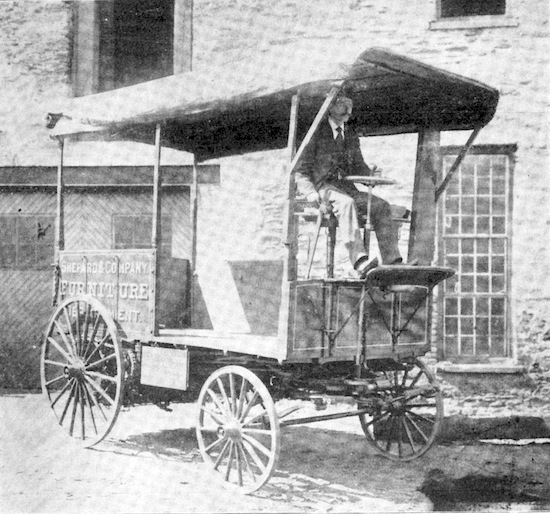 “Two-Seated Motor Carriage” by Alexander Winton of Cleveland, Ohio. The Winton’s utter lack of reliability inspired Packard to enter the business and do it right. “There is a sense of incompleteness about it. You seemed to be sitting on the end of a huge pushcart, propelled by an invisible force and guided by a hidden hand. There is also a seeming brazenness to the whole performance. I dreamed once that I walked down Fifth Avenue in my pajamas in the full tide of the afternoon promenade, and I almost died with shame before I awoke. Yesterday I had something of the same feeling as I sat there and felt myself pushed forward into the very face of grinning, staring and sometimes jeering New York. But it wore away after a while. Gradually I felt that I did not need the protection of a horse in front of me. “The fellow who sold me the horseless carriage said that there was no call for such vehicles from the clubs, a statement that I do not doubt. Your club chappie likes novelty, but he doesn’t want the whole world to watch his indulgences in that direction. He has a reputation for conservatism that he must preserve. He will ride in a horseless carriage by and by, but it will be when to do so will attract no more attention than to ride a bicycle. I know 2 or 3 chappies who have tried the horseless carriage, but it has been after dark and along streets where the electric lights were not too bright. 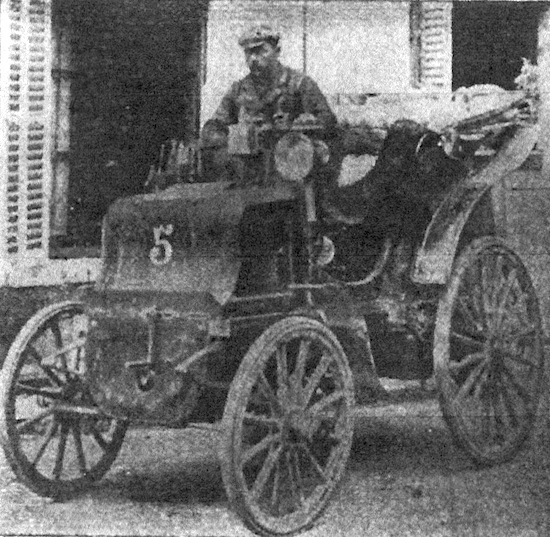 A Panhard & Lavassor of the period. “I believe that I am the first representative of dudedom who has ever ridden in a horseless carriage in the garish glare of day. I congratulate myself that I survived the ordeal. At one time I thought the nasty little boys who thronged the unaristocratic avenues where I went first to avoid my acquaintances were going to stone me. They ran after me and hooted and cast pebbles and otherwise evinced derisive hostility to such degree that I begged the motorman to make haste to the Boulevard where I hoped to find protection among the many other strange and curious things that swarm there on wheels. I was right. Only the horses paid any attention to us on the Boulevard. Elisha’s chariot of fire wouldn’t create the slightest ripple of excitement on the Boulevard. The similar comments of his friend were a little less charitable. 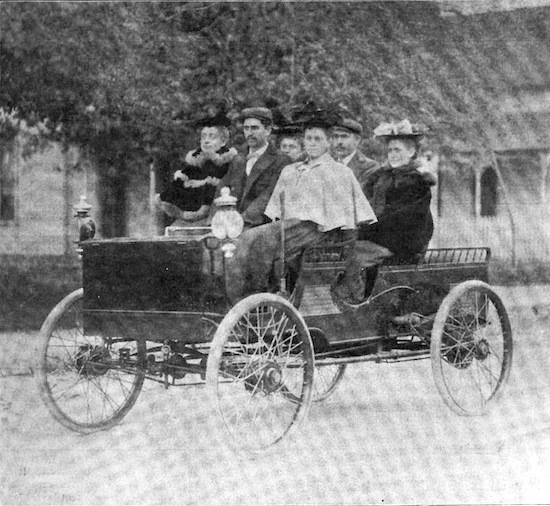 A quote from an English enthusiast in the November 1896 issue revealed a bit of national fervency when he said, “They must build motor cars badly in the States; and in a race between horseless carriages recently organized in New York, and run off in the country roads in the district, out of 28 machines which had been entered, only six started, and these could not mount the hills.” Sadly, it was true. Just about all types of self-propelled vehicles originated in Europe, and the performance difference between their best and our best was measurable. But, just try to drive one in Paris. A notice was posted in August of 1893 that was so restrictive as to make operation of any self-propelled vehicle impractical. You had to first have special dispensation to operate it, and this was revokable at any time. The materials and engineering specs had to be supplied along with complete drawings of the vehicle, it’s motor system, and braking system. Don’t forget to include the trials and experiments “to which the different parts of the vehicle have been submitted”. You had to spell out where it would be stored, and what roads it would be run on. The city’s chief engineer had to look it over and like it, and you had to convince him that the thing would not be a source of danger to the public. You yourself would have to prove competency in operating and repairing it yourself. He would then determine what maximum speed your vehicle should be allowed to run, and what conditions would apply to his approval. If the vehicle changed owners or was modified later, all bets were off and the new owner would have to start from scratch. Nice. You as the driver were to make liberal use of a horn in warning of your approach, and if it ran “silently”, it was to be fitted with bells that rang continuously and always kind of like tying a bell to the cat’s tail. A few envisioned the new transport as more than a toy. Ready for work, a motor van by Cruickshank Engine Works, Providence, R.I.
No need for me to beat this to death, but you get the point. Horseless carriages were not in any sense “cars” when they began to trickle onto roadways. Like bicycles, they were sometimes-exhilarating freedom machines suitable for short rides about town, and that’s it. They were a diversion for those wealthy enough to be able to afford them. At the outset, there were many, many more electric-powered carriages than petrol-powered versions. Only when gasoline engine reliability picked up later, did people begin to envision the horseless carriage as a self-sufficient intercity alternative to trains. For now, it was a mechanical novelty that held little aesthetic or visceral appeal compared to a good horse and carriage. Through no fault of its own, it was also held by some as a flaunted symbol of oppression. To many people, it was an accident waiting to happen. The early automobile was little else, since everyone lived where they worked, and mass transportation was abundant and cheap. So began the automobile. Now that’s the type of history I enjoy reading. Thanks. Thanks, Linda. Yay! History class in high school was such a dry turn-off that I didn’t become interested in it until I was in my twenties and discovered that events were largely determined by social outlooks and perceptions of the time, something that had never been discussed. It’s that difference that I find more fascinating than the actual events that unfolded from them. Glad you enjoyed it! I’m currently reading a biography about William Tecumseh Sherman that focuses on the “social outlooks and perceptions of the time” which helps understand how he became the man he was. I’m enjoying it. Good! There are quite a few biographies and in-depth studies of conflicts in e-book form, aren’t there? I was reading a printed book called Jefferson Davis, American but had to bow out halfway through, as it contained so much tedious filler (do I really need to know how many bales of hay his brother’s plantation raised in yearly counts?) that the book was much thicker than it should have been. I’m now reading a book which very convincingly recounts the War of 1812 as being much closer to a civil war than one against the British.